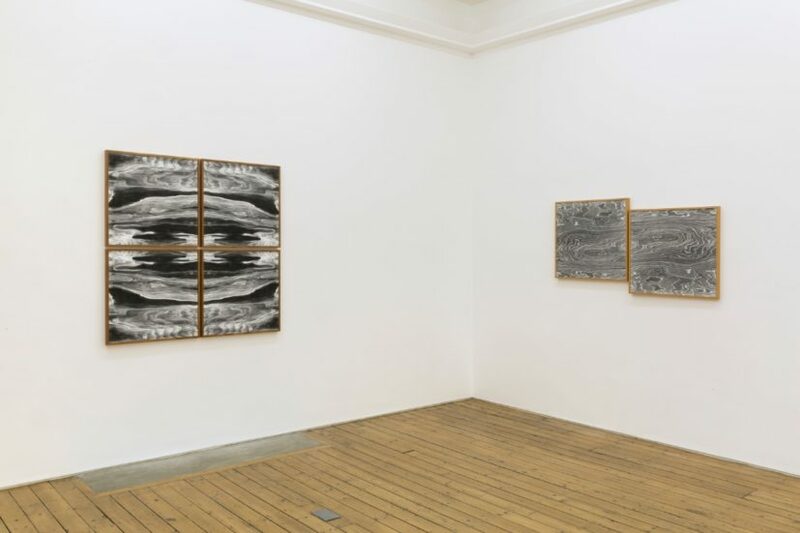 Lisa Oppenheim, Analytic Engine, Installation view at The Approach, London, 2016. Courtesy the artist and The Approach, London. Lisa Oppenheim, Landscape Portraits (Sassafras) (Version I), 2016. Set of four silver gelatin prints in Sassafras frames, Quadriptych: each part: 61 x 61 cm. Courtesy the artist and The Approach, London. 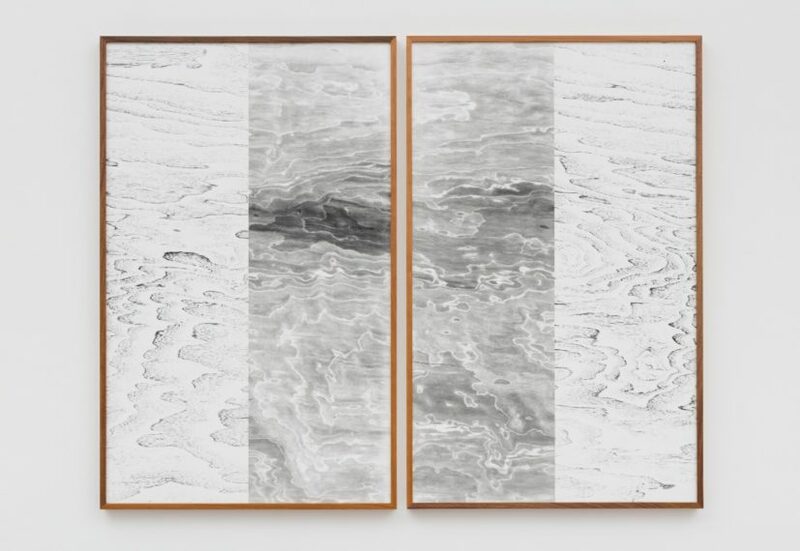 Lisa Oppenheim, Landscape Portrait (Cherry and Walnut) (Version II), 2015, Two tiled unique black and white silver gelatin photographs with unique frames, Diptych: each part: 98 x 64.45 cm. Courtesy the artist and The Approach, London. 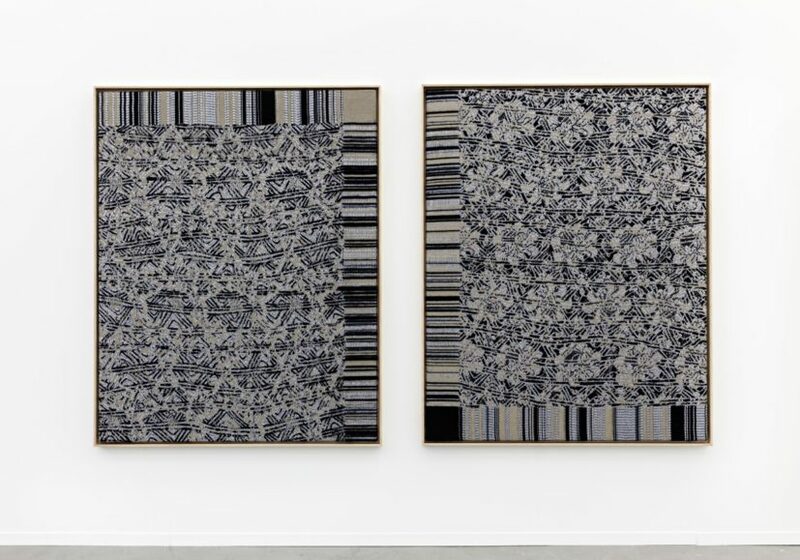 Lisa Oppenheim, Jacquard Weave (SST 638a/SST 520), 2014. Jacquard woven textile in wooden frame, AP 1 of 1, each part: 177 x 142cm. Courtesy the artist and The Approach, London. Lisa Oppenheim (b.1975) delves into the history of photography and redefines its laws of materiality using new technologies. In her series Landscape Portraits, shown at The Approach gallery in Bethnal Green, she reconsiders the practice of image making through a process of decoding and recoding as a new investigation of traditional methods. With each print made through exposure to artificial lighting, she compares her darkroom approach to photosynthesis, with light as a catalyst for creation. 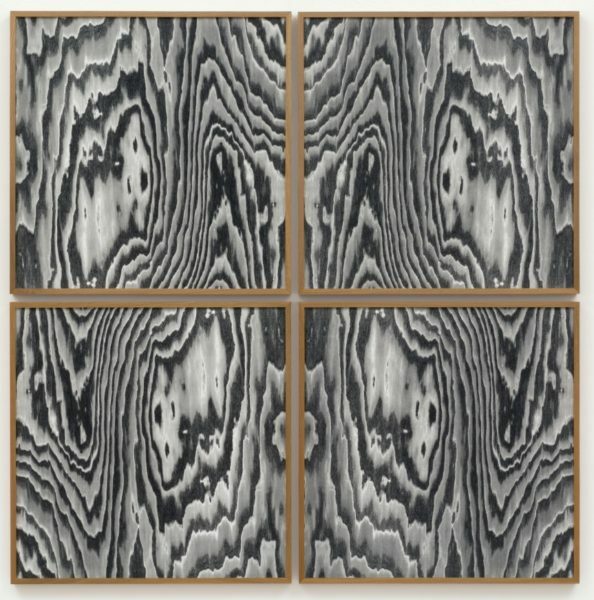 Oppenheim’s approach involves bypassing the camera and applying wood veneers straight onto photographic paper to directly transfer their natural patterns, transporting material into image with no intermediary. The artist uses particular species of trees to create her images, the origins of which are beautifully conveyed through the frames that contain the works made from the same wood. As a continuation of her explorations of material disturbance, Oppenheim also creates textile works that convey the relationship between positive and negative. Drawing influence of photographer Henry Fox Talbot, who used textiles as negatives in his practice, she reverses his technique and creates textiles from images. By employing the process of weaving in the same way negatives would be traditionally layered in the development of an analogue photograph, the artist develops patterns that involve negative space. Oppenheim was born in in New York City, where she currently lives and works. In 2016 she has had solo shows at Tanya Bonakdar Gallery, New York and The Approach, London. She was also involved in happy ending, FRAC Champagne-Ardenne, Reims, France; The Sun Placed in the Abyss, Columbus Museum of Art, Columbus, USA; LA CAMERA: On the Materiality of Photography, Palazzo De’ Toschi, Bologna, Italy and NOW/HERE, FRANZ JOSEFS KAI 3, Vienna, Austria.